Marston residents gathered at the side of the road on Saturday morning for the unveiling of a memorial plaque commemorating those from the area killed in the Second World War. The plaque has been installed next to the Armistice memorial trees planted on Marston Road in memory of those sacrificed. Members of the armed forces were also present, and the names of those killed in the war were read out, before the Last Post was played on the bugle. Independent city councillor Mick Haines, who has been instrumental in the installation of the plaque, praised the turnout. “It’s wonderful that the services have turned out and played the Last Post, it’s fantastic, absolutely fantastic,” he said. Cllr Haines spent £500 on his £1,500 budget allowance on the installation. 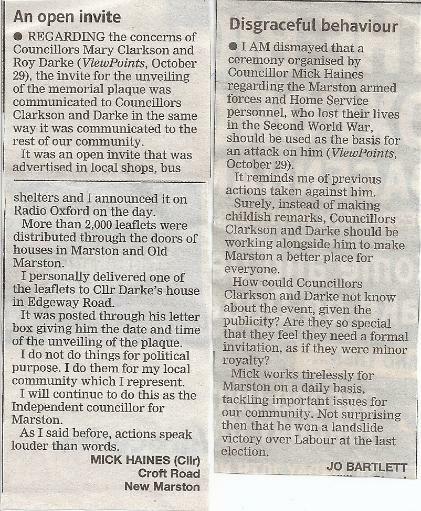 “It’s proved that the people of Marston really do appreciate the sacrifice made. They’re a very strong community and that’s why they deserve it. 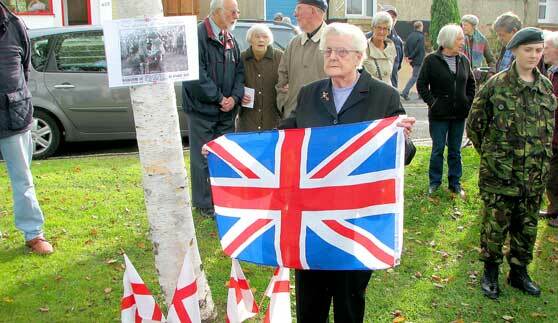 The plaque was unveiled by Josephine Bridges, who was present at Marston’s planting of the Armistice trees in 1950. WHERE are the so-called councillors? On Saturday morning many Marston residents paid tribute to the brave heroes of the Second World War who lost their lives, by attending the unveiling of a plaque near trees planted in their honour some 60 years ago. I’m glad to say that the weather was kind to us on the day. It was nice to see people of all ages attending the unveiling of the plaque and seeing representation by the forces in attendance. I was, however, disappointed by the lack of attendance by some local councillors who, if this had been election year, would have been trading their wares. These people will smile, shake your hand and try to jump through the smallest of hoops for you in election years, but when it comes to the things that are really local and do matter to local residents, are nowhere to be seen. I just hope people remember these things when they come knocking at your door next time. 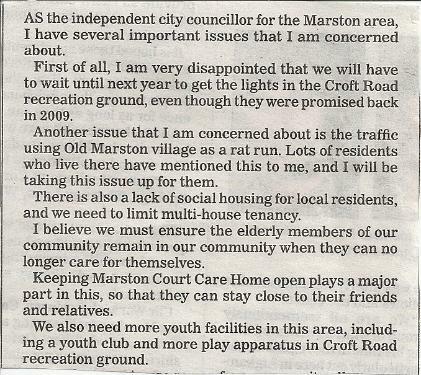 At least Mick Haines (Independent) is trying to do things for the residents of Marston and makes sure the little people are represented. You don’t have to love the man to see he cares. I WOULD like to thank all the people who came to the unveiling service on Saturday for the plaque in memory of the people of Marston from the Armed Forces and Home Service who lost their lives in the Second World War. 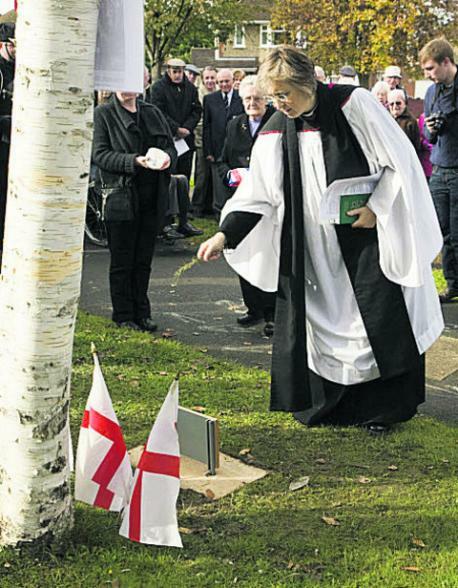 A very special thanks goes to The Rev Elaine Bardwell of St Michael and All Angels Church, Marston Road, who performed the service and blessed the ground where the plaque is situated. Also a very special thanks to Mrs Bridges from Cromwell Close, Marston, who unveiled the memorial plaque. A big thank-you must go out to Andy Higgins, who arranged for the Army and Navy personnel to attend the service and also to have the Last Post played. Finally, a big thank-you to the members of our local community who turned up for the service and the Marston British Legion who put on refreshments for the people who attended.